I had thought that Arthurian scholars already knew this work well, but judging by the available body of criticism–perhaps 5 articles, several of them from the past few years–there’s a world of work to be done. The plot itself treats Uther’s trickery of Igraine (here called Izerna), Lancelot’s lust for Guinevere (here called Zinerva), and the quest for the Holy Grail (here transformed into a Jewish tamchuy, or charity dish). More fascinating than the lengthy opening apology for secular literature (although this is wonderful) is the translator’s many conversions of the story into Biblical and Rabbinic language. Our translator and editor, Curt Leviant, might have followed his own footnote and rendered “This is the history of Sir Lancelot” as “These are the days of the generations of Sir Lancelot”; the text gestures towards the meaning of Lancelot’s name with “is it not written in the book concerning him?”; Lancelot swears by “ha-shem,” the Name, during a lascivious conversation with Guinevere; and knights during a tournament shout “Praised be the living God!.” I’m a little less certain, however, about Leviant’s translation of the odd ending of the work: “[there:] fell many knights, one after another like lambs, and [Lancelot:] cut throats of horses like pumpkins.” Pumpkins? I’m not qualified to judge Leviant’s translation (give it a shot, folks, right here), but pumpkins seems unlikely, since I doubt that pumpkins would have been known to our anonymous author. 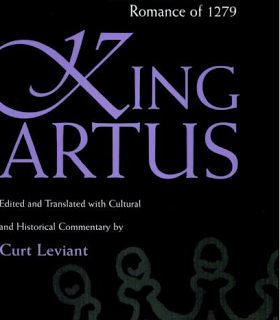 The edition comes with a wealth of supplemental material in which Leviant discusses the Judaizing work of the translator, proposes that Malory and this work drew on a common, now lost, source for certain scenes, and, especially, argues against the clever scholars who have traced motifs in the Arthur and Tristan legends to Celtic prehistorical Gods, to subcontinental folk tales, and to classical myth; instead, he says, look closer to home, in the Bible (Uther and Igraine as David and Bathsheba, Tristan and Mark as David and Saul, Tristan and Morholt as David and Goliath, etc. ), and in the Midrash, which Christian scholars would have known in the twelfth century through the work of Andrew and Hugh of St Victor and Siegebert of Gemblous (the short essay on likely Christian knowledge of Jewish exegesis in the twelfth century is worth the book itself, and a great place to direct students, since Beryl Smalley’s Study of the Bible in the Middle Ages can be intimidating for undergraduates). Leviat makes a strong case for Biblical roots of several of these “Celtic” legends, noting that details in the David story specific to the Midrash, to Rashi’s commentary in particular, appear in the stories of Arthur and Tristan. In some cases, I think he strains his case, but I think a bit of scholarly bomb-throwing is always necessary to shift the paradigm. No doubt scholarship in the 40+ years since Leviant’s edition first appeared has refined his point, but I doubt the Celticists–particularly the badly disguised ‘white pride’ Celtic hobbyists–can ignore the evidence that Jewish storytelling and scholarship at least had something to do with the shape of these tales and their supposed preservation of the ‘authentic’ pre-Christian past of Europe. I’d be happier with the edition, however, if it appeared in a larger volume of Jewish medieval narrative and lyric writing. There are fabliaux, fables, and love stories, all of which could be collected in one volume that might cost as much as this one ($25) and thus be more suitable for classroom use in a good Comp Lit course. In the meantime, though, teach it, and keep teaching it, as this might be the best way to realize my dream of the good Jewish anthology necessary for any medieval comp lit survey. This entry was posted in Book Reviews, MedievalBlog and tagged Jewish exegesis, Jews, king arthur, Lancelot by medievalkarl. Bookmark the permalink.